OH, AND BY THE WAY, NOT SHOUTING WITH THE CAPS, THE CARPLE TUNNEL IS A BUMMER AND THE sh#t KEY IS MY NEW ENEMY THESE DAYS. WE HAVE BOTH A 2009 FJR AE AND NOW A TROPHY SE 2013. I SAY WE BECAUSE THEY ARE MY GAL FRIENDS. I AM JUST THE DRIVER AND MECHANIC. NOT HAVING PUT MANY MILES ON THE TROPHY YET AND ONLY HAVING ABOUT 3000 MILES ON THE FJR THIS PAST JAN-MAY I CAN'T SAY A WHOLE LOT. I DID PUT 3"/1.5" HELIBARS ON IT AS THE PULL FOR ME WAS TOO SHORT. THIS MADE IT SOMEWHAT MORE COMFORTABLE. I ACTUALLY THOUGHT THE SEAT WAS GOOD FOR THE FIRST 2 TANK FULLS BUT THEN IT BECAME HARD ON THE FJR AND I SQUIRM AND WIGGLE A LOT. HAVE A CORBIN ON THE SE AND I CAN'T SAY MUCH AS WE HAVEN'T HAD ANY LONG RIDES AS YET AS I FEEL IT HAS A CAM CHAIN NOISE ISSUE AT THE 29,000 MARK AND I WANT TO ADDRESS IT BEFORE I RIDE IT A FAR PIECE. AS FOR THE RESPONSIVENES, I LIKE THE TROPHY'S BETTER. IT IS TALL BUT I WILL GET A LOWERING KIT SOON AS I KNOW IF THE ENGINE WILL HOLD TOGETHER. THE FJR SEEMS QUITE BULLETPROOF. IT HAD 75,000 MILES ON IT AND A SEMI-AUTO CLUTCH VERSION THAT I REALLY FELL IN LOVE WITH. 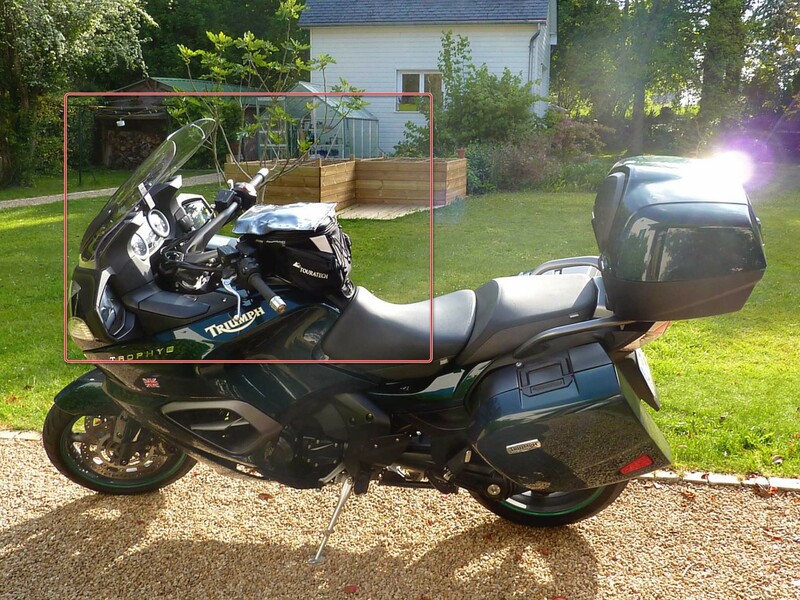 OH HOW THE NEW GOLDWING WITH AUTO TRANS IS CALLING A CRIPPLED OLD DUDE LIKE ME! HA! I ALSO DON'T WORRY AS MUCH AS IT'S A 2 SIDED SWINGARM AND PAST EXPERIENCE WITH MY BMW LT'S SINGLESIDE SWING ARM HAS FAILED AND THAT WASN'T A BIT PLEASANT. WE ALMOST BOUGHT ANOTHER 06 FJR AE,(68000 MI.) FARKLED TO THE MAX, OHLIN REAR, RACE TEK FRONT SUSPENSION ADDED, CUSTOM SEAT, RIDER PEGS, TRUNK AND SIDE BAGS, ETC. THE PARTS INTERCHANABILITY IN TWO LOCATIONS WOULD HAVE BEEN NICE, BUT THE PRICE SEEMED HIGH AND WE WERE WITHIN 100.00 AND NEITHER OF US WOULD BUDGE. I CAN SAY WE HAVE WANTED TO GET BACK TO THE TRIUMPH MARQUE FOR A TIME NOW. I RODE AND RACED TRIDENTS IN MY YOUTHFULL YEARS AND LOVED THE HANDLING COMING FROM HAND GRENADE KAWASAKI H-1 MACH III. I HAD 8 OF THEM ALL TOLD. THE YAMAHA WAS A BETTER BUY AT THE TIME IN FLORIDA THIS PAST JAN. AND A TROPHY SE WAS QUITE A BIT MORE MONEY BUT MAY HAVE PROVED A BETTER BUY THAN THE ONE WE GOT SO CHEAPLY OUT WEST. I DO HOPE THE TRIUMPH HOLDS OUT, I LIKE THE SEATING POSITION, MORE SO WITH A FACTORY LOW SEAT I DID GET TO SIT ON BRIEFLY IN FLORIDA ON A NEWER 2015. THE THROTTLE RESPONCE ON THE FJR IS FINE, AS GOOD AS THE SE, EVEN FOR A CABLE TYPE. THE TROPHY SE SUITS MY RIDING STYLE BETTER COMING OFF THE LT. I LOVE ELECTRONIC CRUISE CONTROL, A RADIO AND NOW A NEWLY LEARNED SKILL, THE MP3 PLAYER, THE RIDE CONTROL AND TRACTION DON'T REALLY INTEREST ME YET SEE IT AS SOMETHING MORE TO BREAK IN THE NOT TOO DISTANT FUTURE. STORAGE IS DECENT COMING OFF THE LT AND EVEN COMPARED TO THE FJR, WHICH DOESN'T HAVE A FACTORY TOP BOX BUT A SMALL AFTER MARKET ONE I INSTALLED MOSTLY AS A BIKEREST FOR MY S.O. I DIDN'T SEE THAT THE FJR STEERED ANY FASTER AND I HAVE HAD BUELL'S TOO. S3T, SO I KNOW WHAT QUICK IS LIKE AND DUCATI'S TOO. I REALLY WISH WE HAD JUST BOUGHT THE TROPHY FIRST AND I HAD NEVER DRIVEN THE PUSH BUTTON FJR, IT SPOILED ME QUITE CONSIDERABLY. I WOULD LIKE TO LOWER THE FOOTPEGS ON BOTH BIKES FOR A MORE COMFORTABLE POSITION ON EITHER. I HAVE A SHORT INSEAM, 29" AND PROBABLY OUGHT TO BE RIDING A CRUISER BUT?? I LIKE SPORT TOURING, KEEPS ME YOUNG, AND IN PAIN, HA! DON'T KNOW YOU'RE ALIVE IF YOU CAN'T FEEL THE BURN. ANYWAY WISH I COULD ACCOMADATE WITH A RIDE BUT TOO FAR AWAY. Most of us in here are so OLD that we're becoming Hard of Hearing anyway ! Don't let him fool you, compared to some of us coconut is a youngster. Thanks for all the good information NEARMISSES. I had carpal tunnel syndrome issues on the left wrist a few years ago, "I FEEL YOUR PAIN" - got the surgery, so glad, so much better! I got back to playing my guitar and other fund things. Go for it! That was one of 12 surgeries I got from April 2014 to December 2017: one more to go in October, then I'll be a 1/2 Million dollar man! So, I got one dealer in the next state south of me, to let me ride a 2017 Triumph Trophy and a 2018 Yamaha FJR he has in stock if I make the trip down there to buy one of them. A dealer on Long Island with both models in stock told me that NY State doesn't allow test riding of motorcycles anymore due to insurance purposes. imagine that - no test ride and fork over thousands of dollars for a motorcycle without a test ride - THAT'S CRAZY! My biggest misgiving about the Trophy is that they stopped making them...makes me doubt Triumph's confidence in their products. I also got a reply to an inquiry about the Trophy from a Triumph UK executive y'all might be interested in reading. I recently found out at my local Triumph/Yamaha Dealer - Preferred Power Sports (https://www.preferredpowersports.com/) that Triumph stopped making the Triumph Trophy Sports/Touring model motorcycle in 2017, or at least not importing them to the USA anymore. Is that true? If so, is there in the works, another version of the Triumph Trophy coming out soon for 2019 - and for import to the USA? If Triumph does bring the Trophy to the USA again, they should do a better job of getting parts here for it too - for better customer support/less down time; at least that's the sentiment on the Triumph-Trophy.com discussion forum webpage. Some Trophy owners complained about waiting weeks for parts and to ride their Trophy's again. Because, inquiring minds want to know if they should make plans for buying a new Yamaha FJR Sports/Touring motorcycle instead (which have been upgraded to Triumph Trophy comparable 6-speed transmissions in 2016), but the Yamaha FJR lacks the same wind protection and radio system of the Triumph Trophy? It seems to me that by dropping the Trophy so suddenly, Triumph has tarnished their reputation and trust in their products in the USA. It also seems that many people inquiring on the Triumph-Trophy.com discussion forum webpage are even reluctant to buy some of the left over 2017 Trophy motorcycles a few USA dealers still have in stock, or even any used ones; for fear of lack of parts/service support here in the USA if they do. It's a shame that one of the oldest and most recognized brand of motorcycles in the world should suffer such a fate. Inquiring minds want to know...is the Trophy coming back to stay, or gone permanently by the wayside like the - YUGO? RE: Triumph Trophy's future in th USA, if any? Thank you for your email below and continued interest in Triumph. Mr. Carleo recently left the business, thus my reply. As you most likely know, the Trophy has been a stalwart model for Triumph over the years. Indeed the company was launched at the 1991 Cologne Show with the Trophy 1200 and 900 models taking centre stage. The model underwent continuous improvement and remained in production through to 2017. Production then ceased to reflect the growing trend in the market away from traditional touring motorcycles and more towards adventure touring models. You will have noticed no new traditional touring models have been launched by our competitors for quite some time, with only minor upgrades being brought through to production. Indicative of a public move away from traditional touring motorcycles. Triumph spends considerable time listening to what riders tell us they want. We have an ongoing program of rider focus groups across the different countries to continually check on which models and specifications are demanded and which are not so wanted. In response to this feedback our range of adventure tourers has expanded to cater for those riders who want to use motorcycles over long distances, in comfort and with luggage. Our Tiger 1200 is clearly different in styling to traditional tourers but still provides the touring benefits, with the bonus of being more capable of being driven across dirt roads and across off road terrain. The smaller Tiger 800 is also available offering the same features. At this present moment in time there are no plans to re-launch the Trophy, however, we continue to listen to regular rider focus groups and in addition monitor our competitors. If the demand for traditional touring machines returns then we of course consider our options. We have to accept that there will exist some customers who will regard this decision as poor. It is sometimes a case that we cannot please everyone, despite wishing to do so and our best efforts. I imagine contributors to Triumph-Trophy.com will be over-represented in this regard. We are of course sorry to make anyone feel let down. In terms of spare parts support, Triumph’s stated policy is to continue to support all models with genuine replacement parts for up to ten years after production ceases. However, our history shows that we continue to provide spares well beyond the ten year minimum. Owners should not have any parts availability concerns. Hearing of parts delays is disappointing. Triumph America put considerable effort into ensuring that we track parts movements and use prediction software to help us avoid “out of stock” moments. I am aware that despite best efforts shortages can occur from time to time. This can result in a delay where parts from the UK are then demanded by the US. As you can imagine, parts supply is a key indicator for the business. Our “Fill Rate” is constantly monitored and is comparable to that of the best of our competitors. I have however, forwarded your email to my UK and US Parts colleagues in order that the complaint can be reviewed. If you know of anyone waiting on parts, please ask that they contact Triumph America (for customer service support, please contact 1-888-284-6288 or e-mail us at tma.aftersales@triumphmotorcycles.com.) who will be pleased to offer assistance. In closing may we repeat our gratitude for following Triumph. We know you have choices when it comes to which motorcycle to purchase. Triumph is sincere in its desire to offer customers a premium lifestyle motorcycle brand and feedback such as your own is always welcome. The poor soul is totally unaware of the lack of marketing done for the Trophy and Hinckley's absolute reluctance to call the hand of the magazine writer's desire to compare it to a much larger, much more expensive comparably equipped K1600, instead of the R1200RT which was more expensive at the time and not even equipped the same. When the R bike was finally upgraded it had a "do not ride" recall for the suspension and once they solved that it was still several thousand dollars more than the Trophy fully equipped. BMW is still selling K1600's and R1200RT's at huge prices, Honda redesigned the Gold Wing and is still selling them, Kawasaki is still selling the Concours, Yamaha upgraded the FJR some, Harley is still selling the top of the line distance cruisers, and of most of those brands are outrageously priced, some almost twice what the Trophy's MSRP was. OK, so Hinckley thinks their riders only want ADV bikes, FINE! We will all end up on something like those above when we need another bike, and probably won't end up with another Triumph of any kind. FINE! With Hinckley that is. TROPHIED IS RIGHT, THESE HIGHER UPS DON'T HAVE A CLUE! IF THEY ACTUALLY MARKETED THIS BIKE IT WOULD BE ON EVERYONE'S TO RIDE ONCE LIST. I DIDN'T EVEN KNOW A BIKE LIKE THIS TRIPLE WAS OUT THERE. I KNEW THE 1050 WAS A TRIPLE & THE 675, THE TROPHY WAS A 4 CYLINDER WHEN I LOOKED AT THEM YEARS AGO, NOT MUCH TO WRITE HOME ABOUT COMPARED TO THE COMPETITION AND WHO NEEDS ANOTHER FOUR? NOT ME! I WAS ASTONISHED TO FIND SHE WAS A TRIPLE. I LOVE TRIPLES, NOTHING SOUNDS LIKE A TRIPLE. I WAS ALL SET TO GO WITH THE 6 CYL BMW 1600 BEFORE I FOUND OUT ABOUT THE TROPHY SE BEING A TRIPLE. THERE'S NOTHING IN THE WORLD LIKE A TRIPLE. THEY ARE JUST WOW! TO ME THEY COULD HAVE PUNCHED IN ANOTHER 300CC AND WENT AFTER THE BIG BEEMER, I'D BITE! THIS BIKE HAS A LOT OF DEVELOPMENT STILL IN HER. PLACES THEY COULD HAVE GOTTEN CREATIVE. EVEN A CRUISER MODEL FOR US SHORT LEGGED GUYS! MAYBE THE SQUEEKY WHEEL DOES GET THE MOST OIL! MAYBE WE OUGHT TO START SQUEEKING IN TOTAL! WHAT SAY YOU ALL? LETS ALL WRITE AND SAY WE DON'T NEED NO STINKIN' ADVENTURE BIKES WE WANT A DECENT BULLET PROOF TROPHY SE IMPROVED. THEY HAVE SUCH SHORT SIGHTEDNESS WHERE THE TRIPLES ARE CONCERNED. I LEARNED THAT ON THE TRIDENT. I RODE MY FIRST ONE IN SUMMER OF 70'. I FELL IN LOVE WITH THAT BIKE AND IT TOOK ME ANOTHER 2 YEARS TO EARN ENOUGH TO GET A PURPLE AND WHITE 72' MODEL AND I IMMEDIATELY WAS RUN OVER ON IT 5 DAYS AFTER GETTING IT AND SUFFERED A MEAN BROKEN LEG ACCIDENT. NOT THE BIKES FAULT. THAT ONE WAS TOTALED AND A 5 SPEED TA BOOT! BOUGHT ANOTHER ONE ON PAYMENTS AND THEN GOT ANOTHER A 69 CAFE' RACER OF SORTS FOR LOCAL AMATURE ROAD RACING. I BOUGHT A 75 ON A VERY HOT DAY IN JANUARY THAT YEAR IN NY STATE AT HOUSE OF POWER, NYACK. PAID A RANDSOM FOR IT! 2900.00 AND 2 WEEKS LATER TRIUMPH DROPPED THE PRICE BACK DOWN TO 1900.00 REALIZING THEY WEREN'T GONNA SELL MANY AT THAT PRICE WITH WHAT THE JAPS HAD ON HAND AND THE BRITS WERE MESSING UP AT TRIUMPH AND NORTON'S REFORMED COMPANY. LOOKS LIKE THE DID A SIMILAR THING TO DEALERS WITH THE TROPHY SE 43 YEARS LATER! THEY DON'T SEEM TO LEARN AND HERE I AM WITH ANOTHER FOSIL BIKE BEFORE IT'S TIME BIKE. ABOUT THE SAME RUN AS THE TRIDENT 69 TO 75 OR 6 IF YOU WANT TO COUNT LEFTOVERS 2013-2017 5 YEAR RUN. WELL, AT LEAST THEY ARE GETTING MORE EFFICENT AT IT BY A YEAR! I BEAT A DUCATI GT 750 ONCE I OPENED THE MUFFLERS UP WITH SOME HOLES IN THOSE CANS. I COULD MAKE THE 900 BMW R90S SQUIRM TO IN THE CORNERS JUST DIDN'T HAVE THE GET UP AND GO PONIES TO TAKE ONE. THAT WAS STOCK! AND THEY CHEATED BETTER TOO! HA! THAT YAMAHA YOU LIKE HAS BEEN AROUND SINCE WHEN NOW 2003 OR 4? THEY NEVER GAVE UP AND EVERYSO OFTEN YAMAHA THROWS THEIR LOYAL FJR RIDERS A BONE WITH MORE CC'S OR AE ELECTRIC SHIFT OR ELECTRONIC CRUISE CONTROL, A BIT MORE MUSCLE IT DOESN'T EVEN NEED. BETTER SHOCKS AND FORKS, THEY DRIZZLE IT OUT BUT OWNERS KEEP BUYINGH THOSE BIKES! TRIUMPH SHOULD TAKE A LESSON FROM YAMAHA. IT'S A GOOD BIKE BUT THE TROPHY SE HAS MORE TO OFFER FOR AROUND THE SAME MONEY TOO. OH WELL, HANDS GOIN' NUMB. MORE TYPE LATER ON THIS. I've had a 2004 FJR and a 2009 GTR1400. Both good but I think the Trophy is the best overall. I thought the FJR had a great engine but I didn't handle just as good as the GTR. The GTR was crazy fast and I really liked it but had a shot on the Trophy and it was just so mush easier to handle. I miss the power of the Kawasaki and FJR but overall I much prefer the Trophy.I'm gutted that they discontinued it. I wanted a new updated one but no chance apparently. I've kept the trophy 5 years now as there's nothing I fancy more than it. I don't want an adventure type bike or a boxer twin RT. The three bikes are good, I just prefer the Triumph. No matter what you pick it will be a good bike.